*What Color Brush Do You Want? FREE WORLDWIDE DELIVERY FOR ORDERS OVER $15! Your hair, as well as your extensions, require proper care in order to look perfect. Brushing is definitely one of the most important part of hair maintenance in general and it also makes your extensions last for a much longer time. Brushing your hair (and extensions) with the right tools is extremely important. Gone are the times when you had static hair that would ruin your pictures or brushes that would leave your head pretty much bald from all the pulling. The solution? 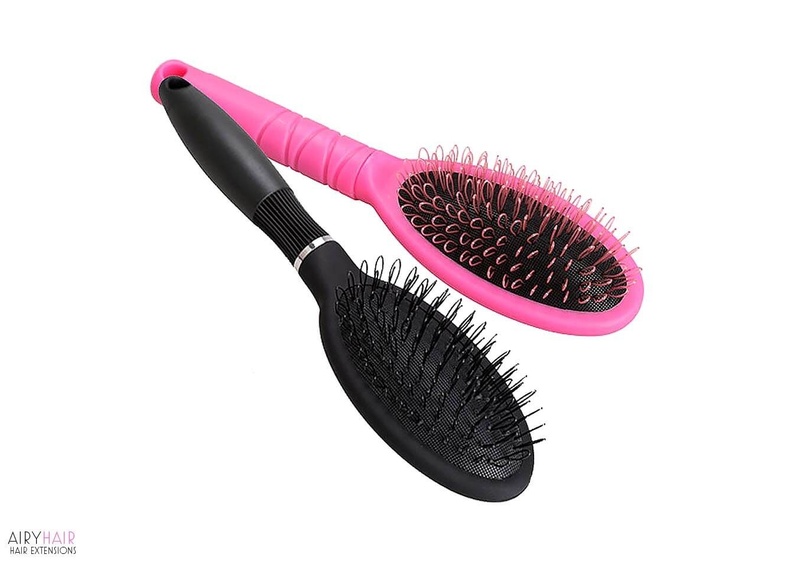 Antistatic hair brush from AiryHair, available in retail and wholesale quantities. AiryHair loop brush can be used on all hair types and textures and its special features make it a lot easier to comb your hair. If you experienced hair pulling or breaking, using a loop brush will prevent that from happening and you won’t have to worry about hair loss ever again. Static in your hair can also be very annoying and it ruins your hairstyle. Using this antistatic hairbrush will instantly solve all of your static problems. Combing becomes even more important when you have extensions. The key for having long lasting extensions is brushing them regularly with the right tool. Regular brushes and combs are not recommended for hair extensions because they can damage them and don’t really do a good job with detangling. If you don’t comb your extensions or use the wrong tool, they will get severely tangled and damaged. And that is definitely not a good look. AiryHair brush is the perfect choice because it gets rid of matting and tangling in no time. Using this loop brush will make it a lot easier to care for your hair and maintain its health. Looking to buy other items in bulk? Check our wholesale hair page as well as special extension discounts for hair salons and hair dressers. How to Brush Hair Extensions? It is very important to know how to properly brush your hair to avoid damage. Try to be as gentle as you can and take your time. Start with holding your hair in the middle and brushing the lower part of your hair first. That way you’re not pulling hard on your extensions and avoiding damage. Then hold a little bit higher and repeat the process. The key is not to be aggressive and impatient and brush often. This is a professional hairbrush that is used by hair stylist and best salons. So if you want to use only the best tools on your hair, order your loop brush now. We use two different ways to deliver your antistatic loop brushes, so you can select the most suitable one. • Free shipping: with this method, your brushes will be sent by the registered air mail and should reach you within 10-20 days (worldwide). • Express shipping: for time sensitive shipments, please select this shipping method as your brushes will come in just 2 to 5 business days. Any questions? Click here to contact us!